Life is sublime in the idyllic suburb of New York City. Recent divorcee, Karen Daily and her two kids have for the first time in years found joy as they settle into the close-knit community of Savage Lane. Neighbours, Mark and Deb Berman, have been so supportive as she moves on in life: teaching at the local school and even dating again. But behind pristine houses and perfect smiles lie dark motives far more sinister than Karen could have ever imagined. Unknown to her, Mark, trapped in his own unhappy marriage, has developed a rich fantasy life for the two of them. And as rumours start to spread, it seems that he isn't the only one targeting Karen. . .
A tense domestic thriller where nothing is as it seems, Savage Lane is a searing satire on suburban life, and a raw meditation on obsessive love. 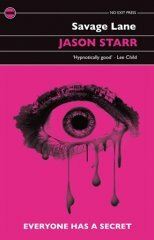 Jason Starr is the author of Cold Caller, Nothing Personal, Fake I.D., Hard Feelings and Tough Luck followed by Lights Out, The Follower and Panick Attack. Savage Lane is his first new crime novel in six years. He was born in Brooklyn in 1966 and still lives in New York City. Savage Lane is a book that has neighbors with a property dispute. You know how that really gets to your guts, so this story has depth and the characters are well fleshed out. I found this book unexpectedly feminist, in that an innocent woman was victimized just because of what men projected onto her. Jason's book is "on the edge of your seat" type of book. You never know what will come next and you are scared. I love Jason and his books. Treat yourself to the latest Starr! Jason Starr is the master of writing suburban noir stories where things start off badly and go downhill quickly thereafter! Compulsive reading.